Today is one of those unusual days in tech. We have multiple players announcing new camera products today. For some, you have to turn your head to the left (look backwards); for others, turn your head to the right (look forwards). In the backwards column we have the US$800 Ricoh GRII. Which is a GR with two hidden I’s, apparently. Sure, there has been some tweaking done, but most sites won't have to replace the image they’re using for the GR with a new one. Oh, wait, it now has an iPhone app for control and image collection, that’s new. I really don’t understand why Ricoh/Pentax is in the camera business any more. If there’s a better example of a true hobby business being run by a large corporation out there, I don’t know what it is. When I dream about Ricoh/Pentax I imagine a charming old 18th century factory where a dedicated team of camegineers tinker with designs that were passed down from the stone ages. Even Leica looks like a rabbit to Ricoh/Pentax’s hare. Actually, Leica probably is moving so fast to the Ricoh/Pentax group that they can’t even see them. Don’t get me wrong. “Oh, that’s nice” wasn’t a back-handed compliment. It was a modest compliment. Ricoh/Pentax keeps making “nice” stuff. Not great that I can see, but just solid, decent gear. In the case of a Pentax K mount or 645 user, the fact that Pentax is ambling along with iterating those products is certainly welcome. But it’s not exactly getting the rest of the world excited. The GRII follows along those lines. Nice (but so was the original granddaddy of this line, even before it got the APS sensor). I’ll give Ricoh full marks for not messing up what has always been one of the most photography-centric UIs, too. But the GRII just doesn’t seem to be the modern, forward-facing product that Ricoh/Pentax would need to break out of the cult following they have and into something more mainstream. That’s despite having what looks like one of the better iOS control apps for a camera with the new GRII. Canon, too, is over there on the left with the latest G. Actually, it’s an old G, shown a few months ago behind glass in Japan. But the press release says it’s a new G. Let’s see, that’s 21 or 22 iterations now, right? 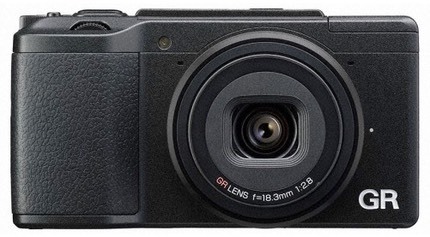 The US$1000 G3x is another big sensor (1”) compact, this time marrying that idea with the “compact cameras must have really huge focal ranges to survive” notion running around Japan the last couple of years. 24-600mm equivalent f/2.8-5.6 lens, to be exact. Makes you wonder why you’d ever need a DSLR. 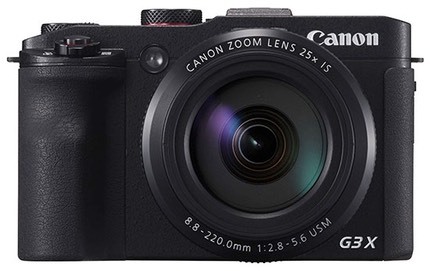 Oh, wait, smallish sensor and no EVF, to name two things. So Canon’s deep into mashup engineering, apparently. A little bit of G, a little bit of whopper bridge lens, some almost-talks-like-a-cable-to-smartphones WiFi, the now requisite selfie mode, and heck, let’s throw in splash proof. No 4K, though. Apparently not everything mashes at Canon yet. Then we have DxO’s new camera, the US$599 and 3.8 ounce ONE. For this you’ll need to turn your head the other direction and look towards the future. Wait, DxO? Okay, now look back to the right (future). Yep, the DxO ONE is remarkably like what I suggested years ago: slips into the Lightning connector on the iPhone and rotates (up to 60°, which I think is not enough), uses the iPhone as the control system (though the camera can also work standalone without a monitor), and uses a small LED/LCD with basic settings for standalone use as I originally proposed (I later upgraded that to a small color LCD). Here again we have a 1” sensor, this time with a 32mm equivalent f/1.8 lens. Most of the features you’d expect in a standalone camera are there (exposure modes, autofocus, continuous shooting, various metering choices, 1/8000 second shutter, variable ISO, built-in storage (microSD), video capabilities, and so on). And yes, it can shoot raw (in DNG format). Heck, it can shoot SuperRAW ;~). 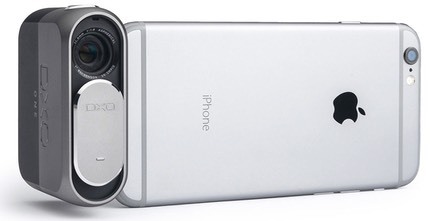 That would be a new DxO idea that combines four shoots into a better image. I’ve been writing the following for an entire decade now: the future is cameras that work with and communicate completely with our mobile devices. Bingo, here we have another example that points to that future (Sony’s QX and Olympus Air are two others, though all three companies really need to hire some better designers, as the future seems a big ugly and in poor form). You can’t get much closer to what I described in 2009 than plugging into the iOS mothership (and that includes iPads, by the way), and if you can’t communicate via a Lightning port, you’ve not been keeping up. I was amused to read that the DxO ONE gets a DxOMark number of 70 to 85, right in what they call the DSLR range. Oh dear. You just did a doo-doo where you eat, didn’t you? As it is, there are subjective components to the DxOMark overall number. Now, by rating your own product and using different criteria, you basically call into question whether any of your numbers are meaningful and should be paid attention to. Not a smart move. It’s actually a bit worse than that. DxOMark to date has refrained from using post processing to generate scores. The scores were supposed to be built on analysis of raw data under controlled test conditions. Yet we have this: “DxO’s advanced processing, which includes the very latest in spatial and temporal noise reduction, allows the ONE to achieve a DxOMark sensor score of 80.” (The italics are mine.) No, I don’t think so, unless “sensor score” now means something else at DxOMark, because that statement is about a special form of image (four shots combined) and post processing tools operating on the results. I’ll be very interested to see how a noise reduced HDR sequence DSLR fares on this new scale. Probably 200 or so ;~). Yes, I’m in a snarky mood today for some reason. I think I can see the future of photography gear fairly clearly, but I find myself constantly staring at the past in terms of products getting introduced. If I want to use the products of the past, great, I’ll just pick up my D810 and shoot. Works great. Can’t say with any confidence that anything else works better. But when I see glimmers of the future, those glimmers are like watching a Terminator movie: is this a future we really want?